On Thursday whilst I was doing some research for my masters thesis I stumbled across an article that rather excited me as it related to one of my favourite brands; Sambo. I tend to collect 1950s pieces by the brand, but the brand under the leadership of Samuel Sherman was still going strong in the 1960s and there were many sub brands too as this article clearly illustrates. Enjoy the images! The family background of fashion dates back to 1898 when David Sherman senior established himself at 24 Shaftesbury avenue as one of London’s leading tailors making for the society trade. Some years later Rebecca Sherman, his wife, who incidentally was French, opened her first boutique at 399 Oxford street and named it ‘Le Petit Magasin.’ The Sherman tradition is carried on by Samuel, Renee and their two sons David and Simon. 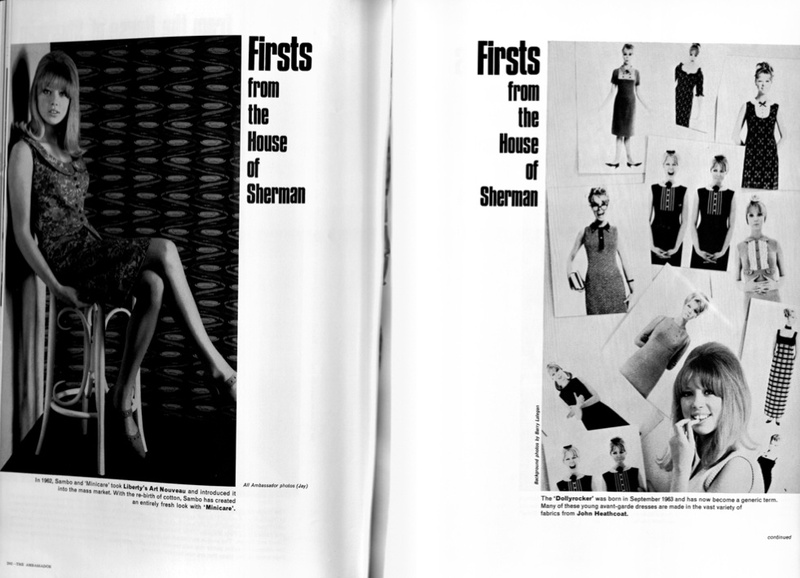 The unique part which the Sherman’s now play in the mass production dress industry is the advanced creative sense that sets fashion throughout the trade. The following pages illustrate some of their trend setting ideas that are now fashion classics. In 1962 Sambo and ‘Minicare’ took liberty’s Art Nouveau and introduced it into the mass market. With the re-birth f cotton, Sambo has created an entirely fresh look with ‘Minicare’. The ‘Dollyrocker’ was born in September 1963 and has now become a generic term. Many of these young avant-garde dresses are made in a vast variety of fabrics from John Heathcoat. In 1963 Sambo devised the first ‘packaged’ dress to sell through specially designed shop fittings. This ‘Packaway’ dress is photographed at Selfridge’s, whose buyer, Miss Parkwood has sold over 12,000 of these dresses in knitted ‘Dicel’. In 1960 Sambo launched ‘Terylene’ lawn in close co-operation with Hollins Thompson, who have worked with them on al the developments ever since; this sheer’Terylene’ Souffle is the result of this co-operation between Sambo and Hollins Thomson. For 1965, Sambo have taken a revolutionary step with ‘Tricel’ taking the cloth to Como for printing to give the fashion aura of Italian silks to ‘Tricel’. 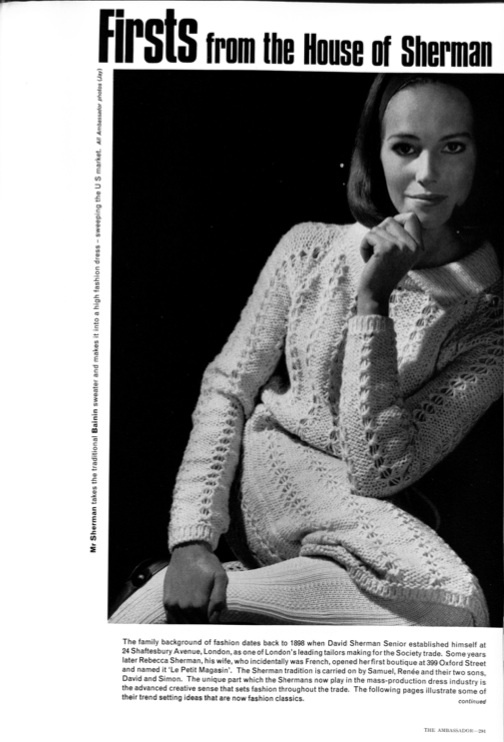 In May 1963, Mr Sherman introduced the co-ordinated stocking with ‘Orlon’ to match their Argyll knits. Since then- these have become a fashion must. This article was featured in the Ambassador. November 1964. Great information. I fondly remember the company, Samuel Sherman LTD., as my late husband was Simon Sherman, Sam and Renee’s son.